Balcones Texas Single Malt – 53% ABV – Read on for my review! 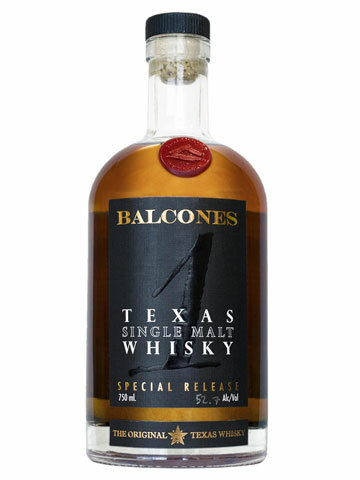 Balcones Distillery is located in Waco, Texas, US and opened in 2008. The distillery was the first to make whiskey in Texas since Prohibition, and they might still be the only distillery in the country making corn whiskey out of blue corn. Chip Tate the Founder, President and Head Distiller of Balcones has a very high commitment to hand crafting their spirits and that commitment extends into the design and layout of the distillery and to the engineering and construction of equipment that they use. Each batch is tasted at all stages from new make through to the maturation every two months to ensure it’s used at exactly the right time. The single malt is immediately detectable as such, however it’s also immediately obvious that it’s not a Scotch single malt, it’s different enough to stop you in your tracks, sit up and pay attention to it. The colour of this whisky is a lovely rich gold colour. However be sure to keep in mind that this is a quality colour…. no caramel will be found here! The nose is fairly dry, fruity and malty. With a East Coast Highland Scotch you might describe some of the dryness as a salty costal influence… here there are dry notes, but it’s not salt, its more like a dry dessert sandiness. Whether that’s the power of suggestion knowing it’s come from a hot Texan climate I’m not sure, but you really do get a feeling that you’re transported to somewhere dry and hot. The palate is still fairly dry, but the fruity young notes ooze out at you instantly inviting you to drink away. There is a lovely full mouthfeel here that coats your palate nicely, while the higher ABV is amazingly smooth, but also high enough that you get a fantastically warm spicy feeling over your palate and onto your chest in the fantastic long finish. There is no age statement on this whisky, however that is probably not something that you should worry about at all… Scotch whisky matures at a known rate and age statements are a known quantity. However whisky matured in the Texan heat can mature at very different rates, so really you need to forget what you would expect from a Scotch and just be assured that this is a very top quality whisky that is aged at just the rate it needed to be before being bottled in small batches. I know Brimstone, a smoked whisky produced by Balcones, very well, and love it. I’m really pleased to still find an underlying distillery character coming through here that is quite recognisable and particularly fine… although the single malt isn’t the same as the smoked corn whisky (how could it be?!) there’s enough similarities to let you know you’re drinking something from the same high quality producer. This entry was posted in Review, Whisky. Bookmark the permalink.